Pouches allow you to feed on the go without bringing along tonnes of unnecessary extras. Why cube when you can squeeze. Other methods for storing and serving baby food haven't kept up with today's parent. 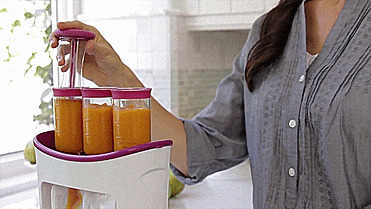 That's why we've created the Squeeze Station, a one-stop unit that presses your delicious, homemade baby food into easy to store and ready to serve pouches. 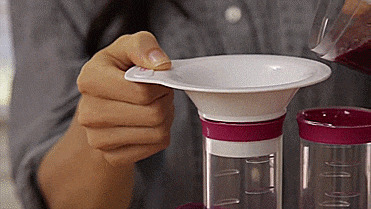 -To use it, start by preparing the squeeze station by inserting the pouches into their designated areas on the station, then twist the filling tubes onto the top of the station connecting them to each designated pouch below them. -You can then blend or mash up your fruit, vegetables, or whatever ingredients you'd like to make into a puree, and then pour it into each of the filling tubes atop the station.